With the imminent expiration of the Bush tax cuts, Mr. Obama and his progressive minions fathom that its termination doesn’t really constitute a tax increase. It’s not a tax hike in their minds, it’s just the conclusion of another failed Bush policy which helped contribute to the ‘great recession’. 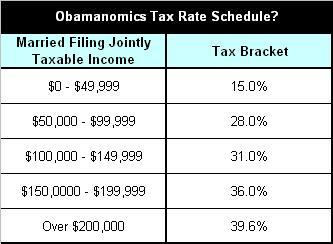 So in 2011, when your taxes climb, and they will advance across the board (as shown here), you shouldn’t blame Obama. Paying a little bit more shouldn’t be a problem now, because we are far better off today under Obama’s economic stimulus, than we were in all of 2001 through 2008. Right? Leave it to Barack H. Obama, II to have an answer for every problem facing Americans today. You got problems? Obama’s got solutions. Problem: You are upside down on your mortgage and can’t see the light of day. Solution: That’s not my fault, it’s Bush’s fault. You’re still getting a tax hike. Problem: You are still trying to work out a loan modification to try to save your home. Solution: Hopefully that will work out, but right now I need to raise your taxes. Problem: You recently lost your home and are struggling to make ends meet. Solution: So sorry, but I gotta raise your taxes too. Problem: You’re on 99 weeks of extended unemployment benefits due to a rotten economy and the failed stimulus program. Solution: Be sure to have taxes taken out of it, because you’re getting a tax hike too. Problem: You haven’t saved enough for retirement and you are trying to find a way to save more. Solution: Well, if you have money to save, then you can pay more taxes. You’re definitely getting a tax hike. Problem: Your business suffered massive losses over the last two years and you’re still paying off loans and credit lines, and trying to dig your way out of a hole. Solution: We all have to do our fair share. A tax hike for you. Problem: The Gulf of Mexico oil spill completely destroyed your livelihood and you don’t know what you’re going to do. Solution: That’s BP’s fault, not mine. Set some of that BP money aside, because you’re getting a tax hike too. Problem: You’re already working two jobs and still living paycheck to paycheck. Solution: Try to cut back on expenses, or get a third job, because you’re getting a tax hike too. Problem: You’re one of the 1.4 million who filed for bankruptcy last year. Solution: Now that all of your debts are out of the way, paying more taxes should not be a problem. Tax hike! Problem: You’re one of the 40 million Americans currently on food stamps. Solution: Since there will be 3 million more on food stamps next year, we have to raise taxes on everyone else to help out folks like you. And if you earn enough income to be taxed in the near future, don’t you worry, you’re getting a tax hike too. Problem: You’ve paid taxes your whole life, and you’re worried that the reinstatement of the 55% estate tax in 2011 will force the sale of your family business. Solution: If you leave an estate worth over $1 million, your estate will be forking over the 55%. But, since you’ll be dead by that time you shouldn’t worry about it so much. When we spread the wealth around it’s good for everybody. Problem: You’re worried about how the known (and hidden) taxes in Obamacare, the Stimulus Act and other stealth legislation will affect you on top of the 2011 tax increase. Solution: Don’t worry about it. You’ll find out when we do. Once we finally finish reading and interpreting all of this mess, … I mean reform, we’ll let you know. Under current tax law, those making over $373,650 a year are considered wealthy, but from now on, if you make over $200,000 a year (formerly $250,000) you’re rich, because Obama says so. It will be interesting to see how Congress resolves this. 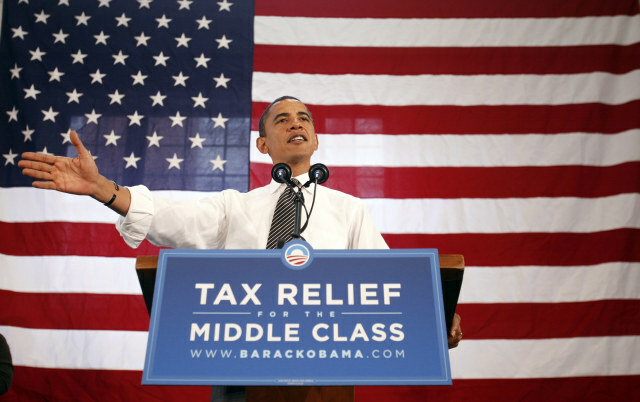 If Congress fails to take action, taxes will rise across the board, by default. Waiting until after the November elections is not an option.